The video sculptures by Swiss artist MARCK are more than a simple combination of video and sculpture: They are a logic consequence of his extensive examination with films and videos, multimedia based projects, performances, music and sculptural as well as kinetic objects. The many years he has been working with these media have showed him their limits and possibilities thus founding a basis for the body of works created since 2001. The determining factor for his video sculptures was-amongst others-his dissatisfaction with the boring representation of films on monitors. Hence he started to rebuild them on the one hand in order to detract the static aspect from the sculpture and on the other to set real boundaries for his films/videos. The examination of humans and their world of feelings is central to MARCK's oeuvre. It is based on the search for a combination of influence from the outside and inner conditions. His performers are always women who are aware of the artistic (and artificial) space surrounding them which they fathom with their bodies. At times they appear as if they were locked as in installations like "Frauenkiste" (Pandoras box, 2007) and "Tuerkisches Bad" (Turkish Bath, 2009), move on dangerous terrain as in his wall objects "Dornen" (Thorns, 2008) and "Sichel" (Sickle, 2009) or in-between the elements water and air like in the installation "human air system" (2005). MARCK himself understands his works as emotionally grounded media sculptures which not only fathom their physical but also their psychical limitations. The women in MARCK's video installations are locked in narrow spaces. They function as symbols for a limited space of action provided by society in which women find themselves. At the same time they also function as patterns for inter-gender relationships and communication. His women are limited in their movement, but use it to explore the narrow rooms provided for them-hoping for a dissolution of the boundaries and physical limitations caused by their actions. The earliest installation by the artist expands the physical space by a historical, socio-cultural one: In "Maria" (2009) a young woman seeks to doff the costume of the Virgin Mary, to free herself from her protective gesture thus also freeing herself from the image of women represented by her. However, MARCK does not want his art to function as a mouthpiece for typical and seemingly obvious women's topics, but chooses the woman to be a symbol for his observations of society. His works are not meant to provide answers and targeted interpretations on certain topics, but raise questions and inspire considerations. The technical media available to him allow MARCK to cross borders of perception. 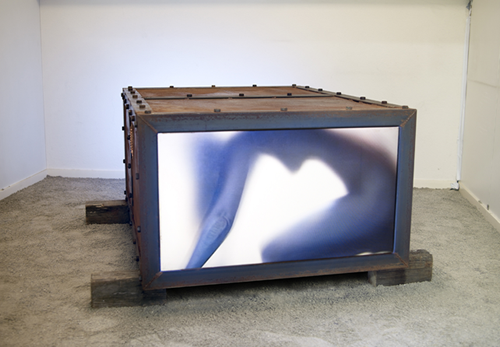 The video is not only a messenger (of a visual message), but due to the sculptural frame also receives a spacial dimension which in turn he seeks to break through, e.g. in "Dusche" (Shower, 2008) where water comes from the frame, in "Sichel" (Sickle, 2009) where the pendulum is swung beyond the frame of the light box or in "Kreuz" (Cross, 2009) where a crucified woman is reconstructed using video fragments. In doing so, MARCK does not allow coincidence, but builds his works on the foundation of exact contextual and technical visions. The technique itself is not the priority but a means to an end-an organ for MARCK's observations and his urge to evoke certain feelings. MARCK's video sculptures and installations offer possibilities to their observers to identify our physical and psychical limitations (anew) and to break free.